Global autonomous robot market is expected to reach USD 11,920 million by 2024, growing at a CAGR of 13% during 2016 – 2022. The report covers the forecast and analysis for the autonomous robot market on a global and regional level. Future opportunities for the market are discussed in the report. The report has been provided in terms of value (USD million) and volume (Units). The revenue generated by the prominent industry players have been analyzed in the report. The autonomous robot market has been analyzed using Porter’s Five Forces Analysis. The market is segmented on the basis of mode of operation, mobile product, end-user industry, which in turn is bifurcated on a regional level as well. The report deals with the in-depth quantitative and qualitative analyses of the autonomous robot market. An autonomous robot can be defined as an intelligent machine that has the ability to perform the tasks with greater precision and quality. There are some types of robots that completely perform the tasks by themselves without human intervention. Like human beings, autonomous robots also have the ability to take their own decisions and then perform an action accordingly. Autonomous robots are helpful in situations where a higher rate of precision, speed, and tolerance is required. Autonomous robots are used in a wide range of applications in different domains. 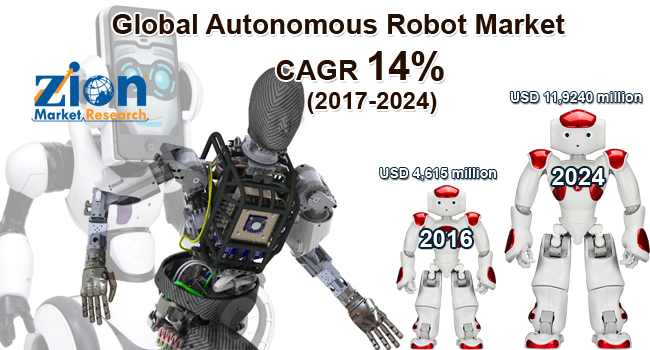 The global autonomous robot market was valued at around USD 4,615 million in 2016 and it is expected to reach more than USD 11,920 million by 2024. The global autonomous robot market is expected to grow at a CAGR of over 14% between 2017 and 2024. In terms of volume, the demand for the autonomous robots is expected to reach more than 115,400 units by 2024 at a CAGR of around 13% during the forecast period. The key factor that is driving the growth of the autonomous robot market is the increasing demand for the autonomous robots from the different end-user industries. Autonomous robots are used in various applications such as in the healthcare sector (pharmaceutical delivery), manufacturing industries (material handling and removal), military operations (unmanned ground investigation vehicles and search and rescue operations), home applications (security purposes, floor cleaning, and lawn mowing), and much more. In applications such as warehouse distribution, painting and de-painting, assembly, and inspection, autonomous robots are in huge demand. The integration of the artificial intelligence in the field of robotics has taken the global autonomous robot market to the next level. Some challenges associated with autonomous robots are technical accuracy and communication protocols which are limiting the growth of the market. Communication protocols are a set of rules that are necessary for exchanging valuable information which is yet an issue in the autonomous robots. The global automation robot market has been segmented on the basis of mode of operation, mobile product, end-user, and regions. The autonomous segment is expected to grow at the highest CAGR of 15% over the forested period. This can be attributed to the growing demand for fully- and semi-autonomous robots across the world. The latest mobile product of robotics and automation can be seen in technologies such as driverless cars, 3D printing, and chatbots. The autonomous segment held a major share of 40% of the market in 2016 (in terms of volume). By mobile product segment, unmanned aerial vehicle (UAV) is expected to grow at highest CAGR of 15% between 2017 and 2024. Increasing terrorist activities across the globe and increasing demand for highly precise technologies are expected to drive the growth of the UAV segment over the forecasted period. The unmanned ground vehicles (UGV) held the largest market share of more than 50% and valued around USD 2,245 million in 2016. UGV robots include a navigation system, diverse type of sensors for detecting intruders & fires, cameras for surveillance purposes, and other detectors. Thus, they are being used in a variety of applications which, in turn, has boosted the sales units of UGV segment. By end user, aerospace & defense is anticipated to grow at the highest CAGR of around 17% between 2017 and 2024. Countries across the world majorly have an increasing need for security, border patrol, surveillance, inspection, and homeland security in order to prevent dangerous situations. For this purpose different kinds of autonomous robots are in huge demand in the aerospace & defense sector. As per the statics, the revenue generated by the top 100 aerospace & defense companies was USD 689 billion in 2015 which significantly increased to USD 709 billion in 2016. A huge difference was also found in the profits gained by the companies; in 2015 it was USD 64 billion and USD 69 billion in 2016. With the increasing military expenditure by the countries, it is expected that the demand for the autonomous robots will increase significantly in the coming years. The Asia Pacific autonomous robot market is projected to grow at the highest CAGR of more than 15% during the forecast period. China has stepped into the leading position, and South Korea has become the second largest market. This is mainly owing to the major investments in electrical and electronics industry and technology advancements. The sales of the robots have been amplified in order to meet the rising demand for industrial robots across the globe. China is taking steps and is implementing plans in order to upgrade their factories into completely automated factories. The report also covers detailed competitive outlook including company profiles of the key participants operating in the global autonomous robot market. The key players included in this market are Aethon, Aviation Industry Corporation of China, Bluefin Robotic, Cimcorp Automation, Clearpath Robotics, Fetch Robotics, GeckoSystems, Hi-Tech Robotics Systemz Ltd., Locus Robotics, Mobile Industrial Robots, Oceaneering, Omron Adept Technologies, SAAB, Seegrid Corporation, SMP Robotics, Swisslog, and Vecna. In April 2017, Locus Robotics introduced Locus Robotics Advanced Navigation (LRAN) software at the ProMat 2017 Show in Chicago, IL, USA. LRAN marks a significant advancement in Locus’s autonomous robotics navigation software, enabling multi-robot warehouse fulfillment for retailers and 3PL providers. It is designed to improve the movement and coordination of multiple robots in fulfillment center settings.